How close have you been to the Sun with your eyes or how about bringing the clear ball of fire in your sight without blinding your vision? 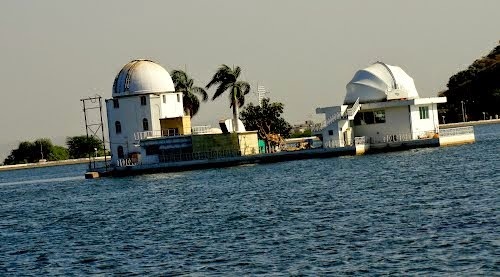 This is what you can treasure at 'Udaipur Solar Observatory' on your trip to the Udaipur city in Rajasthan state of India. A tour to Udaipur city is more than just an adventurous camel ride or the shopping center of Lehenga Choli or the majestic city palaces. Right in the middle of the Fateh Sagar Lake lies a gigantic solar observatory that is very similar to Big Bear Lake Solar Observatory in South California, the U.S. If you will visit Udaipur city it is for sure that you'll be guided to visit Fateh Sagar Lake deep in the heart of the colorful city with many of its wonders attracting tourists from across the world. The lake body surrounds one of the biggest solar observatories and best among few on-land observatories in the whole of Asia as this place sees clearest skies most of the time of the year and the density of clouds is less as compared to other observing zones. Built by a scientist Dr. Arvind Bhatnagar in 1975, this observatory is on an island that is favorable for solar observations, making it one-of-a-kind dedicated to extract images of the Sun. This is one of few places in the world where you can observe the Sun's power without damaging your eyes. The main office administrative office building is separate from the observatory that is situated at the banks of Fateh Sagar Lake. Whereas the solar observatory lies in the middle of the lake. A visit to the observatory can be done by taking a ferry from the banks of the lake at a short distance filled with fun and excitement.